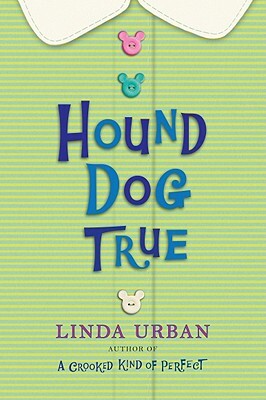 Hound Dog True by Linda Urban. Grades 3-6. Harcourt Children's Books, September 2011. 149 pages. Review copy provided by my local library. 1. Mattie is a character that many kids will be able to identify with. She's not the funny kid. She's not the kid who's getting in trouble all the time. She's the shy kid. She's the quiet kid, the worrier, the kid who doesn't even know how to name what's worrying her. We needed Mattie. 2. A bullying incident that might not even count as a bullying incident, but that shows that bullying can come in many different forms and affect kids greatly. In the fourth grade, Star violated Mattie's privacy by peeking in her story notebook, and what could have blossomed into a kindred friendship, instead turned into incessant mocking. After that, Mattie stopped writing stories. 3. Uncle Potluck! Mattie's eloquent, compassionate uncle is the Director of Custodial Arts at her new school and Mattie's one hope for salvation. I love this character because he's so much more than just "Mattie's janitor uncle". He's smart and feisty and takes an interest in Mattie. I love how this simple sentence evokes such a picture of where Mattie is (and where she isn't). As much as anything else, this is a book about scratching the surface, about knowing that there is so much more to people than just what you can see. It's a quiet sort of story, different in tone from Linda Urban's first book A Crooked Kind of Perfect, but for the right audience it's going to be the perfect book. This is a book that will speak to those kids who are shy about letting their hound dog truths show. Read more reviews at A Fuse #8 Production and Jen Robinson's Book Page. Hound Dog True is on shelves now!